As Chairman and President of the PDGE Youth Federation, Teodoro Nguema Obiang Mangue will also host two music concerts in the country’s largest capital cities, Malabo and Bata. The toy distribution will take place over the following days in every city and village across the island and continental territories. The motivation for this joyous occasion is Minister Nguema Obiang affinity to the youth of the nation and his concern for their prosperous development at all ages. Minister Nguema Obiang will visit Malabo on the 21st and 22nd of the month followed by a visit to Bata where he will personally distribute the gifts and provide a holiday message. He is also sscheudled to visit the provinces of Kie Ntem and Wele Nzas and the south central territory. To close the holiday season, Minister Nguema Obiang will sponsor and host two music concerts New Year's Eve and New Year’s Day featuring some of the most well known music stars in Equatorial Guinea. Earlier this year, Minister Nguema Obiang participated in a three-day special session of the first "Youth Congress," sponsored by the Democratic Party of Equatorial Guinea(PDGE) in the city of Bata, which drew attention to many challenges facing Equatorial Guinea's youth and formulated recommendations to address numerous areas, including access to low-income housing and higher education for the country's citizens. In addition, Minister Nguema Obiang Mangue, was unanimously elected president of the Youth Federation of the PDGE, Allied Youth Partnerships and Labor Affairs for his work in support of Equatorial Guinea's youth. As part of Equatorial Guinea’s (República de Guinea Ecuatorial) efforts to boost development of the agricultural sector in the country, President Obiang Nguema Mbasogo met with the Director General of the United Nations Food and Agriculture Organization (FAO), Jack Diuof, and the Representative of the Permanent Mission of Equatorial Guinea for this Organization, Crisantos Obama Ondo, to review cooperation relations between the two parties, at the FAO headquarters in Rome, Italy. During the meeting, President Obiang stressed how important it is for the national productive sector to guarantee sustainable development and for the FAO to continue providing technical support for the government. In a discussion with the FAO Director-General, President Obiang agreed to a short, middle and long term priorities and reinforced the need to increase technical capacity and increase support for the farmers so that their productive activity is more profitable, both socially and economically. The two also discussed the need to reformulate the National Plan for Food Security and the FAO Director-General agreed and expressed the institution’s availability to support the Equatorial Guinean government in this process. The same support would be given in to conduct an inventory of marine resources in Equatorial Guinea, as well as for the Ministry of Promotion of Women, through the Pramur project. Equatorial Guinea has a fertile soil and tropical climate which are conducive to high yield agriculture. The Minister of Agriculture, Teodoro Nguema Obiang Mangue, has led the efforts to conduct awareness tours, promote coffee and cacao, focus on attaining food self-sufficiency in the country in order to support and improve the agriculture sector. The Ministry of Agriculture has reached out to international allies to help boost the sector. Ghana has agreed to provide assistance on the production of cocoa. The government has also seeked help from China. As the backbone of many African economies, agriculture is at the forefront of Equatorial Guinea's efforts to diversify its economy and meet the goals of the government's Horizon 2020 development plan. The country is working to become an emergent and sustainable economy by 2020. During his stay in Italy, President Obiang also had the opportunity to meet with the Ambassador for the Republic of Congo, Kamara Dékamo and strengthen relations between the two countries. The minister in charge of missions, Alejandro Evuna Owono, and the civil cabinet representative, Braulio Ncogo were also present at the meetings. As part of his activities surrounding the 3rd African-European Summit in Libya, President Obiang Nguema Mbasogo of Equatorial Guinea (República de Guinea Ecuatorial) held meetings with world leaders to discuss cooperation and progress in the country. Equatorial Guinea has been making significant preparations in advance of the African Union Summit next year and moving toward achieving the U.N. Millennium Goals. The purpose of the African-European Summit was to discuss investment, economic growth and job creation and create a joint strategy to integrate models of sustainable development and growth for Africa and Europe. 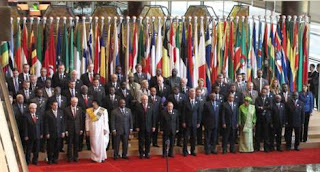 This was the third summit between the African continent and the European Union following those celebrated in Egypt in 2000 and Portugal in 2007. President Obiang held several important meetings with African leaders, and with the main representatives of the European delegations. In a meeting with the minister of foreign affairs of France, Michèle Alliot-Marie, the two discussed the wish of the French government for the country to increase bilateral cooperation and to focus more attention on the training of human resources. President Obiang later met with his Italian counterpart, Silvio Berlusconi. Most of the people who met with President Obiang offered their support during the next African Union Summit and showed their support for Equatorial Guinea’s work in the fight to achieve the Millennium Development Goals and those of the country’s Horizon 2020 development plan. During a meeting with the Portuguese prime minister, José Sócrates, President Obiang discussed strengthening the relations that exist with Portugal and other aspects related to the possible entrance of Equatorial Guinea in the Community of Portuguese-Speaking Countries (CPLP). Similarly, President Obiang also held meetings with Ali Bongo Ondimba, his Gabonese counterpart from the co-organizing country of the 2012 African Cup of Nations, and with John Evans Atta Mills, president of the Republic of Ghana, with whom he has excellent relations. President Obiang also met with the heads of state of Mozambique and Eritrea. Also in attendance at the summit were President Obiang’s minister in charge of missions, Alejandro Evuna Owono; the vice minister of foreign affairs, international cooperation and Francophonie, Eustaquio Nseng Esono; the ambassador of the Permanent Mission for Equatorial Guinean to the African Union, Ruben Maye Nsue Mangue and the ambassador of Equatorial Guinea in Cairo, Benigno Pedro Matute Tang. Equatorial Guinea’s (República de Guinea Ecuatorial) Prime Minister of Foreign Affairs, Ignacio Milam Tang, met with the German Vice Minister of the Federal Minister of Foreign Affairs, Cornelia Pieper to review bilateral collaboration between Germany and Equatorial Guinea in the agriculture, culture, education and training of human resources sectors. Both parties stated their interested in consolidating relations between Malabo and Berlin. Also present at the encounter was the Ambassador of Equatorial Guinea in Germany, Cándido Muatetema Rivas. The German delegation had the opportunity to interview President Obiang Nguema Mbasogo. The delegation accompanied by the Minister of Foreign Affairs, Pastor Micha Ondo Bile, representatives from various ministries and the President of the Chamber of Commerce of Bioko, Gregorio Boho Camo visited the Gepetrol facilities. The delegation was also able to visit some places of interest in Malabo, such as Sipopo, where the government is constructing the headquarters to host the African Union Summit. Pastor Micha Ondo Bile also met with the Spanish Parliament member and speaker of the Partido Popular (People’s Party) in the Foreign Affairs Commission, Gustavo Manuel de Arístegui y San Román. Both parties were pleased to discuss how they can strengthen diplomatic and commercial relations between Spain and Equatorial Guinea. Gustavo de Arístegui accompanied Spanish companies that showed interest in investing in Equatorial Guinea’s energy, construction, hotel and catering trade sectors. The Spanish initiative comes after frequent invitations on behalf of Equatorial Guinea to the private Spanish sector to take part in the economic development of the country.